The Airbus A310 is categorized as a medium to long-range wide body airliner. It has started operations in 1978, it was the 2nd plane created by the Airbus consortium of European aerospace companies. 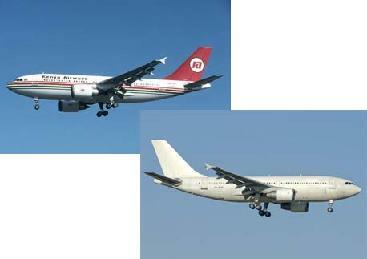 The A310 is a reduced version of the A300 which is the first twin-engine wide body airliner. The A310 first began development as the A300B10. While based on the bigger A300, the A310 featured a number of major modifications. The fuselage was reduced by 13 frames compared to the A300B, reducing also the seating to just around 200 to 230 passengers and resulted into a new higher aspect ratio wing of lesser span and area was made. New and lesser horizontal tail surfaces, fly-by-wire outboard spoilers and a two crew EFIS flight deck were integrated whilst the engine pylons were common to suit both engine options. Max passenger capacity at nine abreast 280. Typical two class arrangement for 20 passengers at six abreast and 192 economy class passenger eight abreast. Cargo capacity in fore and aft under floor compartments can hold 2.44 x 3.17m (88 x 125in) pallets or a total of up to 14 LD3 containers.